Both the Bible and history record how the people of God are continually in need of self-examination and reformation. But in every case of reformation there first had to be a recognition of the need for reformation. Nehemiah had to be informed by Hanani that the walls of salvation were broken down and the gates of praise were burned with fire—a great need, and what a beautiful example of reformation. Isaiah, Jeremiah and Hosea were all reformers. Habakkuk saw the sad condition. He asked God, “Why dost thou shew me iniquity, and cause me to behold grievance? for spoiling and violence are before me: and there are that raise up strife and contention. Therefore the law is slacked, and judgment doth never go forth: for the wicked doth compass about the righteous; therefore wrong judgment proceedeth” (Hab 1:3-4). There was great need of reformation of the people of God; thus we have that wonderful little prayer for reformation in Habakkuk 3:2—“O LORD, I have heard thy speech, and was afraid: O LORD, revive thy work in the midst of the years, in the midst of the years make known; in wrath remember mercy.” He saw the great need of reformation. This little verse shows us his fear, he was afraid, he heard an alarming voice that produced an appropriate prayer and a serious plea. This verse also has a potent argument for reformation—“in wrath remember mercy.” The psalmist saw the need for reformation, and many of his prayers for reformation are recorded. “Turn us [restore us], O God of our salvation” (85:4). Three times in Psalm 80 he cries, “Turn us again,” O God of hosts. We could multiply texts and examples in almost every prophet in the Old Testament. In every case there had to be a recognition of the need. Too many people in the church do not know the marks of a true church, and therefore, see no need of reformation. However, every discerning minister and Christian would not question the need. Would not every discerning Christian agree that the church is having little spiritual influence in the world? No doctrinal foundation. No fixed objective standard of righteousness because the Ten Commandments are missing in most churches. The doctrinal foundations have been removed, or buried, in powerless ritualism. When the moral and doctrinal standards are removed, it leaves the church in a sea of confusion without a compass. The Bible asks the question, What can the righteous do if the foundations be removed? There is a desperate need for reformation of the church. Our Lord’s last words to the churches that needed to be reformed are found in His messages to the seven churches in Revelation 2 and 3. These final messages reflect His deep love and concern for His Church. These messages are rich in instruction, warning, and comfort. 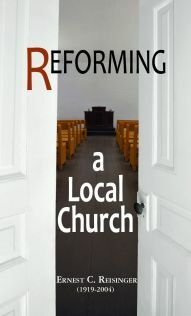 These messages contain much that is very relevant for reforming churches on the contemporary scene. Many churches are sleeping the sleep of death. Some are more sound asleep than others. Some are like Laodicea—they think they have need of nothing, but in truth they are pitiful, poor, blind, and naked. In spite of the sad condition, there are always some children of light living among the dead. When Jesus said to strengthen the things that remain, He knew that there were some that could be strengthened. The Bible and history record many accounts of reformation. Sometimes whole communities, and in a few cases, whole nations have been affected by reformation. How does reformation come about? First, the cause is always from above. That is the divine side. But it is just as true that there is always, always, always human instruments on earth involved. That is the human side, or the means God uses. The cause is God; the means is man. Appendix 2: Use Books to Spread God’s Truth in the Earth!